Placer Food Bank wishes to invite you to join us for a special Pampered Chef Fundraiser that will benefit our organization. Led by Heather Dwyer, Pampered Chef Director, we will be hosting a fundraiser at our warehouse facility. This event is open to the public and good for all ages. So bring along your friends & family and join us for healthy and indulgent cooking demos! RSVP not required but highly recommended for guest goodies. Any questions? Please feel free to contact Diana Yruegas, at diana@placerfoodbank.org or by calling 916-783-0481 x103. What is Round-Up from the Heart®? Each year, Pampered Chef introduces a limited-edition product to help raise funds for Feeding America®. Starting September 1, 2018, Pampered Chef is offering a Kitchen Paring Knife. For each Kitchen Paring Knife or Set purchased from September 1, 2018-February 28, 2019, the company will donate $0.30, the equivalent of 3 meals*, to Feeding America. 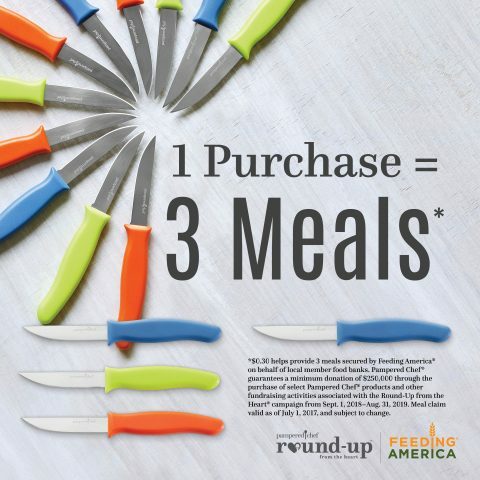 Pampered Chef also encourages Cooking Show guests to “round up” their orders to the nearest dollar or more. These contributions benefit the Feeding America network food bank that serves the local community where the donation is made. In our community, that means your contributions come to Placer Food Bank. We are the only Feeding America food bank in the Sacramento region.